In mid-September, I joined five friends on a kayaking adventure down the Lower Gunnison River in western Colorado. Our launch point was the Pleasure Park outfitters camp east of Delta at the confluence of the Gunnison and the North Fork of the Gunnison. The take-out came seven days later and approximately 60 miles downstream at the small community of Whitewater. An aerial image taken from Google Earth can be seen here of the section of river that we traveled. No permits were required to float the river. But the BLM does have rules and regulations for its use. 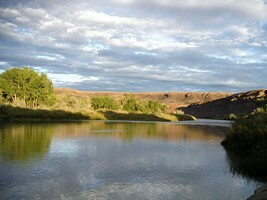 I have posted a link to the BLM river use website at the bottom of this page. Prior to 2012, a thru trip from Pleasure Park to Whitewater was not possible without an illegal portage around the Hartland Dam near Delta. In 2012, a fish and boater bypass was created around the dam. 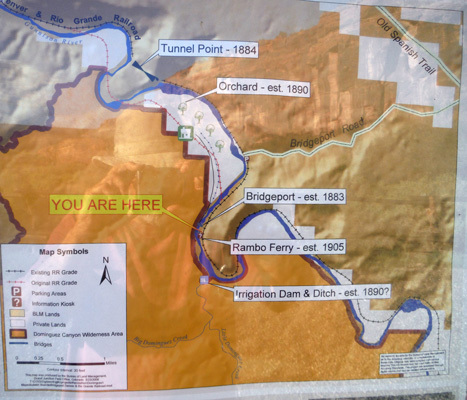 And early in 2013 the re-construction of a hazardous diversion dam four miles below Pleasure Park greatly improved boater safety through that section of the river. So with the completion of those two projects, 15 to 20 miles of river travel were added to the Lower Gunnison River trail. Since we had contracted with the Pleasure Park outfitters to provide a take-out shuttle, they allowed us to park our vehicles in their lot and we were given permission to launch from their beach. 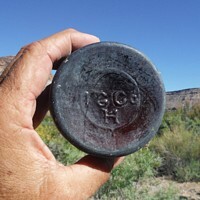 There is a public BLM launch site nearby. The trip began under overcast skies. The flotilla was made up of 6 tandem kayaks, each one filled with a week's supply of gear, food, water and other beverages. Below Pleasure Park, the river flows for several miles through a fairly narrow canyon that is 600' or so in depth. The canyon sides were steep and quite barren with only an occasional juniper tree or sage bush. The geological structure of the canyon was clearly visible. The water flow in this section of the river was around 800 cfs. Some maneuvering around an occasional rock or ledge was necessary. When the channel divided we usually made the correct choice of which route to take. Only one time, did several members of the group have to retreat back up a channel that did not go through. There was an occasional grounding on a gravel bar. The navigation through the area of the re-constructed diversion dam below Pleasure Park was accomplished with no issues. While there were stretches of river in which there was a feeling of remoteness, we did pass several large farms and orchards at the river's edge that broke up the wilderness feel. The only people that we saw on the river for the entire trip were a couple of guys who were drift fishing down from Pleasure Park. They were on a day trip down to a parked vehicle on one of the river's access roads. As we approached Delta, the canyon walls faded away and the river was no longer contained in a narrow gorge. The signs of civilization increased dramatically. There was little doubt that we were coming to a town. We navigated through the support structures of three highway bridges and one railroad bridge. We had been told before hand, that only one camp area would be available near Delta because of all of the private land. The warning was that the private landowners "were sensitive" to trespassing boaters. The first night's camp site, a small patch of BLM property, came up on river right, approximately 14 miles below Pleasure Park. The camp area was not developed and did not appear to have received much use. While some brush had obviously been removed, the site was still very much grown over. Several of the guys chose to camp in the tall grass on a narrow bench near the river while the rest of us found space in between the sagebrush bushes a bit farther away. There were quite a few mosquitoes. Sounds from the nearby highway and farm equipment were pretty constant. There was really no place to set-up or use our fire pan. As a place to spend a night, the site served its purpose. We were ready to move on the next morning. The campsite was located about a 1/2 mile above the only real whitewater on the Lower Gunnison River, the Hartland Dam bypass. We had passed several ominous signs on the approach warning us about a dangerous waterfall downstream. The signs called for boaters to exit the river. As a new river kayaker, I didn't really know what to make of those warnings. What we had read about the use of the bypass did not match the tone of those signs. We decided to proceed. It turned out to be quite an exciting ride down through the passage. I ended up turned around midway through, but somehow managed to continue paddling backwards down to the quiet water below. The more experienced guys in the group rated the passage as a level 3 rapid. We thought later that the warning signs that we had seen above may have been directed at those folks in canoes. The photo below of the Hartland bypass was posted online here recently. 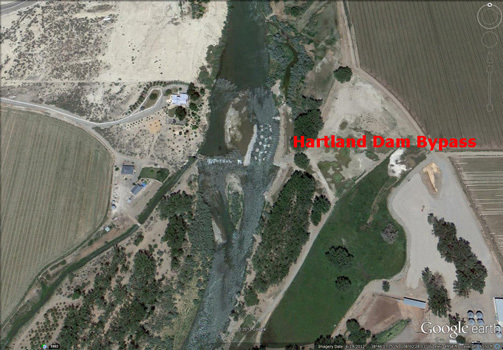 The photo below is a Google Earth View of the Hartland Dam and bypass. After the excitement of the Hartland Dam bypass, it was a quick float on through the open valley to downtown Delta. The river became quite shallow around the Highway 50 bridge, but everyone made it through without grounding. It was interesting to view the hustle and bustle of the town as we quietly floated through. 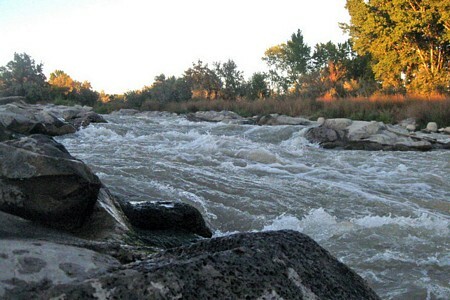 On the outskirts of town, we passed Confluence Park, the usual put-in for a Lower Gunnison River float trip. Below the confluence with the Uncompahgre River, our speed picked up dramatically. The Uncompahgre had added another 800 cfs to the flow of the Gunnison. The total flow, now at 1700+ cfs, was much higher than that normally associated with September. There would be no low-water issues for the remainder of the trip. Several miles below Delta, we floated under a railroad bridge. The tracks on river right would continue along with us the many miles to Whitewater. Soon after the bridge, the river channel was contained once again within tall and steep canyon walls. Our second night's camp was located on river right near the mouth of Rattlesnake Gulch. This was a much better site than the one near Hartland Dam. The nearby railroad tracks and an old road were the only real signs of civilization. One of the highlights of day 3 was the sighting of an old water wheel. It appears that the wheel was used to lift water to an irrigation ditch that was quite a bit higher in elevation than the river. I thought that the design of the lifting buckets was pretty clever. After the confluence with the Escalante Creek, the nature of the Gunnison canyon changed, with the rocks becoming more red in color and the cliffs much taller. This change in terrain reminded us of southern Utah. We encountered one rocky diversion dam along the way that at the higher water level was easily negotiated with a bypass to river left. The approach to the mouth of Dominguez Canyon was spectacular! Once there, landing the boats required some effort however. A lift of several feet was necessary to get each up onto the bench above the river. Our original float plan did not have us spending quite so much time at Dominguez Canyon. But because of the increased rate of river flow, we had made very good time. Having several days available at this one location gave us the opportunity to explore away from the river. While on our layover at the mouth of Dominguez Canyon, we were entertained daily by the passage of several Union Pacific trains. These very long trains of more than 100 cars made their eastbound runs empty and returned down the grade to the west full of coal. They apparently picked up the coal in the Paonia area east of Delta. 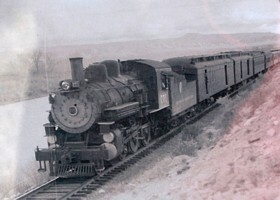 The original road bed was constructed in the 1880's as a narrow gauge railroad by the Denver & Rio Grande Western Railroad Company to connect the towns of Gunnison and Grand Junction. The run through the meandering canyon was accomplished with the use of just one tunnel constructed in 1884. 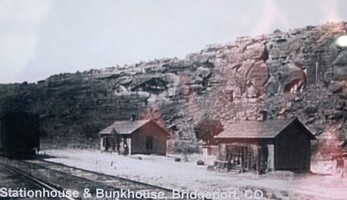 Bridgeport was a maintenance camp and shipping point for the early railroad, established in 1883. Today, a siding and large trash dump associated with the old camp are pretty much all that remain. 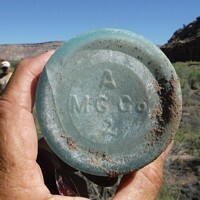 These are some of the old bottle bases that we saw on the trash dumps at Bridgeport. They possibly date from the late 1800's through the early 1900's. The structure in the photos below is on river right at the edge of the old Bridgeport site It is what remains of an old cable ferry. The ferry, constructed around 1905 by William Rambo, was used to transport fruit from his orchards on the other side of the river. The support structure collapsed soon after construction while Rambo's wife was crossing the river. He rebuilt the supports and concreted them into place. Closer inspection of the structure shows that at least one of the logs had been used as a railroad tie. Directly across the river is a large rock, called Cable Rock, that served as the anchor for the ferry's cable. Rambo's brother in law carved his intitials into that rock. 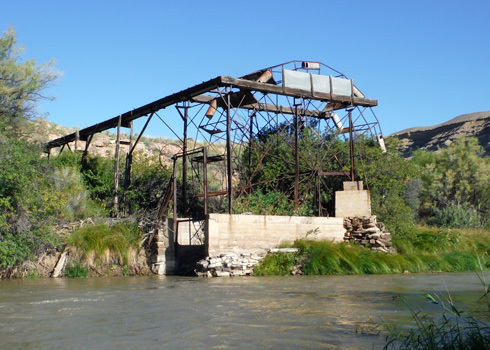 This old cable suspension bridge spans the Gunnison River at Bridgeport. It was moved here from another river crossing in 1935. It is still in use by full-sized automobiles/trucks today! This modern steel bridge was erected by the BLM to provide hiker and equestrian access to the Dominguez Canyon area. 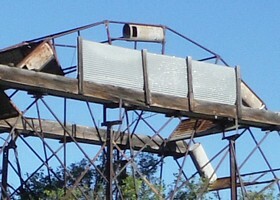 Between the mouth of Dominguez Canyon and Bridgeport are the remains of an irrigation ditch that once carried water out of Dominguez Creek to orchards below Bridgeport. The original ditch may have been constructed in the late 1800's. The mouth of Dominguez Canyon serves as an access point to the Dominguez Wilderness created in 2009. Administered by the BLM, the wilderness area is known for its scenery, prehistoric and historic sites. 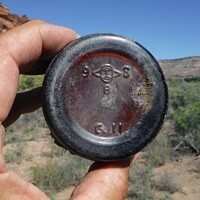 I have provided a link to the BLM website on the Wilderness area at the bottom of the page. We had several opportunities to walk up into Dominguez Canyon. The photos below are from those walks. There is a very large rocky debris field that extends across nearly the full width of the Gunnison at Dominguez Creek. That outwash has divided the river into at least two channels. From our camp on river left, it appeared that the flow in the near channel was much quieter than the frothy turbulence that we could see in the channel on the far side of the river. It was decided that the left channel was the way to go. However, the flow in that channel was directed into and under the corner of a large boulder on the bank. I was uncomfortable with that and so I carried my empty kayak and gear a hundred yards or so past the boulder and loaded it downstream from there. The other guys found a shallow chute that bypassed the boulder. The float from Dominguez down to Whitewater went very quickly. We covered the mileage in a little over 3 hours. As we neared Whitewater, the canyon opened up. Signs directed us to stay along river right to the take-out. The take-out area was very small. It was a good thing that we had separated into two groups. There would not have been room for all of us had we all arrived together. Our truck had been dropped off as promised by the outfitters so we were able to quickly break down the equipment and stow it away. Surprisingly, we were able to fit everything into or on the one vehicle! After returning to Pleasure Park to retrieve the other vehicles, we all headed to Delta for showers and and a celebratory steak dinner. The rest of the afternoon was spent sitting in the hotel parking lot rehashing the highlights of the trip. The next morning we woke up to heavy rain. Boy, had we been lucky! 1. 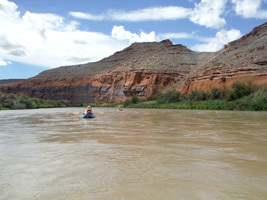 BLM website that describes the rules and regulations for river travel on the Lower Gunnison River. 2. BLM website that describes the Dominguez Wilderness area.